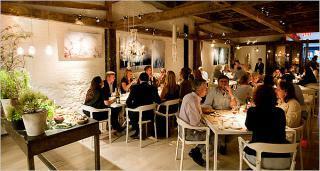 ABC Kitchen is a chic American restaurant by one of the world's famous chefs Jean-Georges Vongerichten. The restaurant is committed to offering the freshest, safest ingredients with seasonal menu that is focused on local farm ingredients. They menu is free of pesticides, synthetic fertilizers, insecticides, antibiotics, hormones, is GMO-free, and naturally and humanely sourced from farmers with fair trade. ABC Kitchen is also a celebrity sightseeing hotspot along with New York socialists. This charming restaurant offers phenomenal food with a great atmosphere and is a must for tourists and locals.